I would like to have a science club in our middle school. How should I get started? What types of competitions we can enter? What else should I consider? I have taught Life Science and Physical Science for 15 years. How long will your meetings be: 30 minutes? A class period? When will you meet? Before or after school? A club period during the day? How often will you meet? Weekly? Bi-weekly? Monthly? Is there a limit on the number of students? How will you determine students’ interests and their level of commitment to the club activities? Where will you meet? Do you have to stay in your lab or on the school campus during the meeting time? Are field trips a possibility? Will transportation be an issue? Is there an activity fund your club can access for materials, entry fees, or transportation? Participating in formal competitions could provide a focus. These programs have established guidelines and activities and culminate in a project or contest. They do require a high level of commitment, so look at their websites to determine the time and financial issues. You could do an informal trial for a year before committing to an actual competition. See the list at the end for some competitions appropriate for middle schoolers. This is by no means a complete list, but I’ve heard good things about these. Check out the article “Competing to Learn” in NSTA Reports, which describes how some teachers are using competitions to help motivate students and has some suggestions on how to get started with competitions. Another possibility is involving your club in “Citizen Science” projects. In these regional and nation-wide projects, participants record observations in their own communities and upload data to a project database. Students get to see “their” data used as part of a larger project and are encouraged to pose their own research questions. The Cornell Laboratory of Ornithology has several ongoing projects, including BirdSleuth, which I have worked on. The article Using Citizen Scientists to Measure the Effects of Ozone Damage on Native Wildflowers in the April 2010 issue of Science Scope describes an air quality monitoring project. And in Project BudBurst participants chart their observations of plant growth. These are just a few examples of this type of authentic science investigation. Ask students about their interests (and be prepared for shoulder shrugs or “we want to blow things up”). But you might be surprised at the topics they suggest, such as ecology, technology, genetics, or robotics. You could choose a different theme each year. 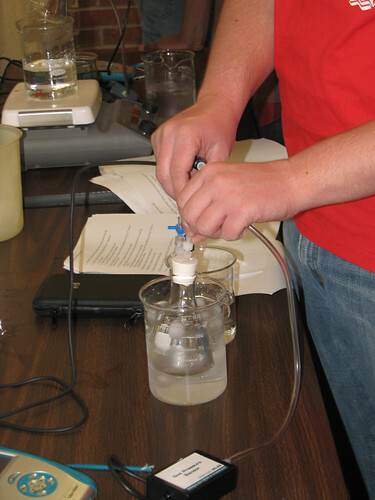 Have students expand science to other parts of the school. Set up and maintain aquariums or plants in the office, library, or other public areas. Create and maintain flower gardens, vegetable gardens, or water gardens. Spearhead a school recycling project, especially for paper or cafeteria waste (see the article “Trash Pie” in March 2010 Science & Children). Collaborate with an elementary school. Your club could conduct demos for younger students or assist them with science projects or family night activities (if scheduling permits). Create videos in which your students explain or demonstrate concepts for the younger ones. I observed a project in which older students created “kits” out of small boxes with items such as magnets, hand lenses, small collections of shells, forest floor “litter,” pictures of animals, flash cards, leaves. The students made illustrated field guides or activities to go along with the kits. The elementary teachers used them as take-home activities. Set up and monitor a weather station. The students’ report could be part of the daily announcements. Some local television stations even provide the equipment and share student data on the nightly news. Conduct build-it events such as egg drop containers, boat floating, kites, paper airplanes, or simple robotic kits. The Internet has suggestions for many of these. Activities involving global positioning satellites and geo-caches are becoming popular, too. If field trips are a possibility, visit local water treatment plants, museums, university research centers, or health centers to see the labs, interview scientists/researchers, and learn about careers. Volunteer at parks or nature centers. However you develop your club, keep it low-key and enjoy yourself. I still reminisce with former students about tracking animals in the snow, determining the water quality at the local reservoir, and testing paper airplane designs. This entry was posted in Ask a Mentor and tagged competitions, science club. Bookmark the permalink. Trackbacks are closed, but you can post a comment. Every state has a Master Gardener programs (I think). Google “Master Gardner MN” for example. The Master Gardners are gardening enthusiasts! What students learn from them will be practical knowledge they will use throughout their lives. Too often students can explain photosynthesis and DNA details but have no idea as to how to care for plants and animals. What a great suggestion! Some Universities also have county extension agents who can be a resource, as well as any state game/fishing commission folks. Thanks. I would like to start a science club as well. I have interest in discovering and experimenting things. However, I am not sure yet how to start a club like this. I know that it needs intensive preparation especially in financial aspect. Many of the activities for clubs or interest groups do not require special funding. I often used things that we already had in school. So you could start with a small group of students and share your interest in discovery and experimentation! i was wonderig if you did anything in yellow stone park if so how did you do it? and also can you give me pointers for starting my science club? what would a person need in a science club in college? Thanks so much for all these wonderful information. Hope to keep in touch much more regularly. Thanks, I’m a new science teacher in Florida and have students interested in a science club to help stop global warming, and I am looking for other ideas. This site is perfect! I have started to purchase some laboratory materials or instruments to establish a science club but I am really thinking how to begin, which group of students and how many persons to start with?